Originally known as Springville, it was changed to honor early settler Emory Rains, when Rains County was organized in 1870. 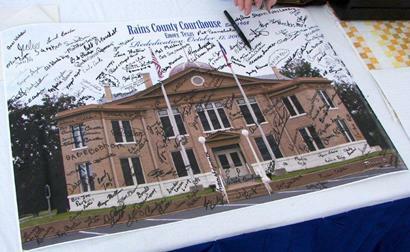 Emory became the county seat and the first courthouse was a log building. A second courthouse was built (1872) but soon burned (1879). A third (brick) courthouse, constructed in 1884, burned in 1890. The Denison and Southeastern Railway arrived about 1880, establishing Emory as a shipping point for lumber. In 1885 the town's population was 600. By the end of 1929 the population reached 1,000 but two years later it had declined to 750, and by 1936 it had dwindled further to 447. 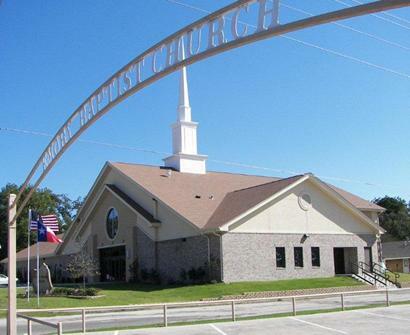 After the construction of Lake Tawakoni in the late 1950s, a number of retirees began settling in the area boosting the population back to the 1929 population of 1,000. 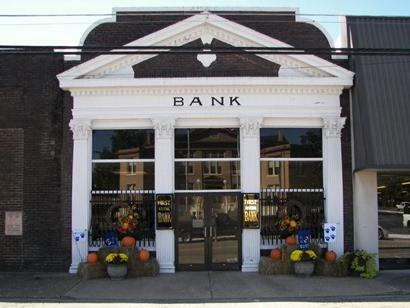 The First National Bank on the south side of the square. Buildings along N. Texas St. (TX-19) across from the courthouse. 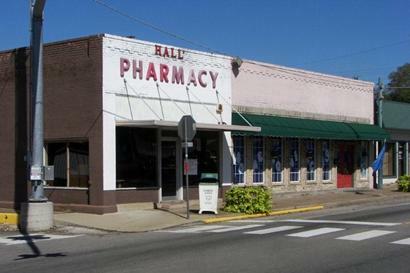 "Hall's Pharmacy on N. Texas St. The red doors are the entrance to the local newspaper, the Rains County Leader." 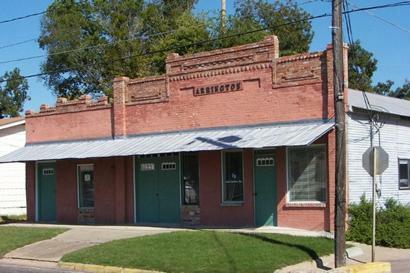 "The Arrington Building on the north side of the square. Businesses failed to develop on the north side of the courthouse square due to the lack of a north side entrance on the courthouse." Emory Baptist Church, northeast of the courthouse square. 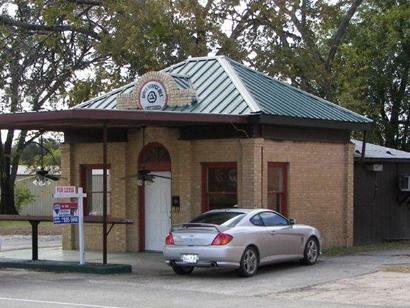 Old gas station, southeast of the courthouse square. 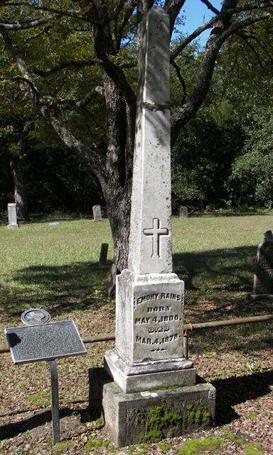 Texas pioneer Emory Rains served as an alcalde under Mexican rule and as a counselor in the East Texas Regulator-Moderator War of the 1840s. As a senator in the Republic of Texas Congress, he helped pass the Homestead Act. Rains also served in the 1845 Constitutional Convention and in the State Legislature, where he worked for the formation of this county, which was named in his honor. 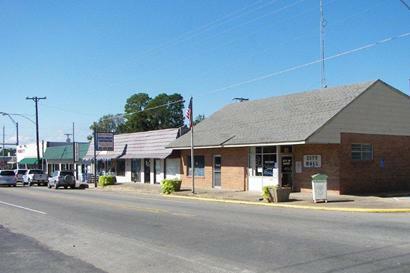 The Rains County Seat, Emory, was also named for him. 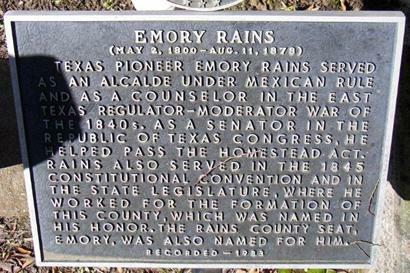 Gravesite of county and county seat namesake Emory Rains at the Emory City Cemetery. Historical marker at Emory Rains' gravesite. ... Those whirling funnels of high wind Texans keep an eye out for each spring used to be known as cyclones, not tornadoes. Whatever they are called, they are capable not only of wreaking terrible destruction, but doing things than can only be called weird. Take, for example, what happened to John Zimmerman�s mule. 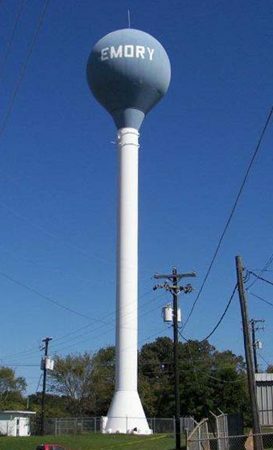 "On the day of my visit, the entire town was without water for several hours."